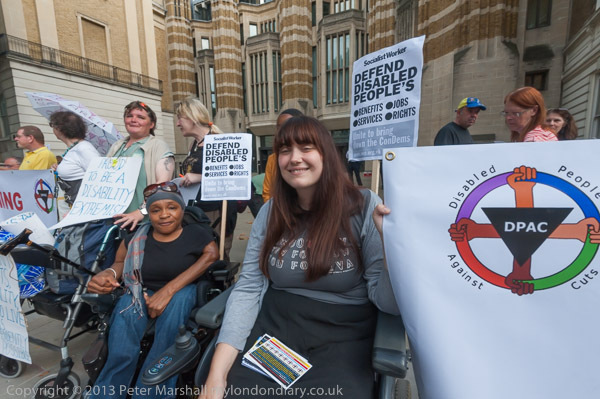 DPAC (Disabled People Against Cuts) have led the active protests against austerity in the UK, showing a determination that has seemed altogether lacking in the Labour party and only present in a few of the trade unions, mainly from local activists rather than the hierarchy. Its perhaps not surprising, for they are the people who have really felt the brunt of the cuts in services and in benefits, at the same time as being subjected to savage changes in the welfare system and the abuse of Atos-administered tests which even reports commissioned by the government have shown to be sadly failing. 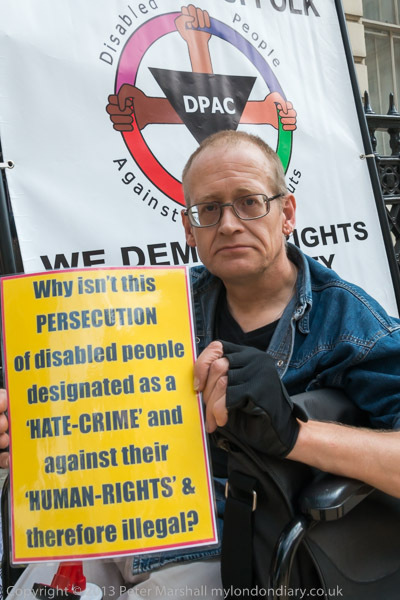 Whistle-blowers have also revealed how they were ordered to trick disabled people by picking on statements that could be used to deny them benefits to which they were clearly entitled, and how they were asked by supervisors to alter the assessments of some they had found qualified for benefit to fail them. The system provides Atos with a built-in financial incentive to fail claimants and it would appear they are desperate to maximise their profits rather than concerned to perform the tests diligently. 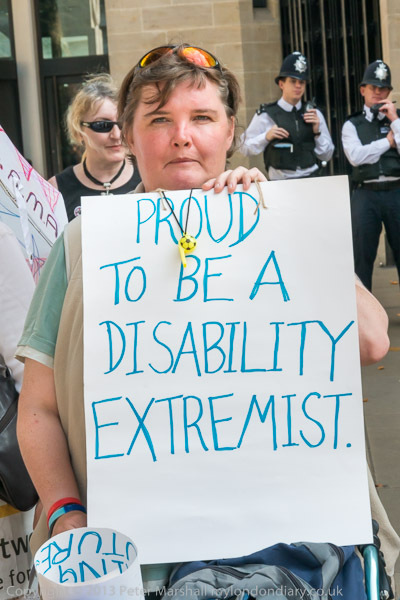 It’s hard to avoid the conclusion that the Dept of Work and Pensions under Ian Duncan Smith cynically saw the disabled as an easy target, thinking they would be able to get away with removing benefits from those who they saw as weak and disabled. IDS could not have been more wrong. Although the withdrawal of benefits has driven a few to suicide, it has radicalised others, and united them to fight against the cuts. Calling people disabled I think gives a wrong impression; although they each have a particular disabiity, these are people who have impressed me with their abilities and with their determination. In covering the ‘Freedom Drive’ which came as the culmination of a week of meetings and actions, I started with a problem. Four different actions were taking place at four different government ministries at the same time, and being in four places at once is tricky. True they were not a great distance apart, but from the Department of Energy and Climate Change (DECC) in Whitehall Place to the Dept of Transport on Horseferry Road is almost a mile, with the other two ministries en route. I decided to start at one of those in the middle, the Department of Health, partly because I thought this would be the largest of the four groups, but also because I’d actually been invited to the event by one of the people who would be there. 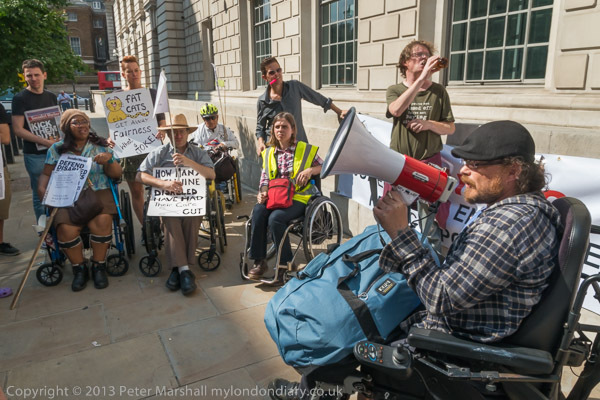 It was perhaps also the ministry of the four involved with the most obvious links to the disabled, and I’ve been involved with many of the protests about cuts and privatisation of our NHS. Andy Greene of DPAC speaking about fuel poverty outside the DECC in Whitehall Place. I was correct and it was the largest of the morning protests – you can see the pictures and story at DPAC Picket Ministries – with eventually around 50 people present, but it was rather slow to start, and I spent well over an hour taking pictures there, before rushing the quarter mile up the road the protest at the DECC. 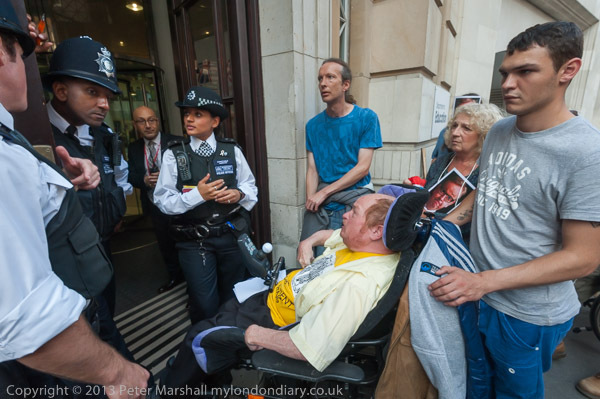 There were more familiar faces in a protest about energy prices – with many disabled people suffering from fuel poverty. By now I was running seriously late in my plan to visit all four sites, so I quickly took some pictures before rushing off to the Department of Education. It was a day when my bicycle would have been very useful, but I don’t like taking it with me when I’m covering protests. Finding good places to lock a bike isn’t always easy, and the chance of it being stolen – particularly for a folding bike like mine – are very high. The best cycle locks only delay the well-equipped thief for 30 seconds. It’s just too much to worry about. The protesters were determined – and finally after I left a small group were allowed to take their manifesto in at the Dept for Education & Skills. Failing a bike, almost certainly the fastest way to cover the two thirds of a mile to the Dept for Education & Skills would be on foot (I never feel rich enough to take a taxi, and in any case it can sometimes take a while to find one.) I’m no longer fit enough to run the whole distance with a heavy bag, but could still make it in perhaps 8 minutes if I had to. I thought about it and decided to take a bus, the journey in the traffic only took around 4 minutes longer. As I was intending the go to visit the final of the four protests, I saw the people from that making their way up the street towards me with their banner. I took a few pictures of them, but didn’t in the end use any. But I was pleased I’d managed to cover three out of the four events that lunchtime. This entry was posted on Saturday, October 5th, 2013 at 08:09 am and is filed under My Own Work, Political Issues. You can follow any responses to this entry through the RSS 2.0 feed. You can leave a response, or trackback from your own site.